Thai people have a great passion for food. We love eating and with all our natural ingredients, we keep creating recipes and dishes. We are no exception at the Old Thai House with the abundance of fresh herbs and the many vegetable varieties widely available in England. We are now able to prepare a selection of our most famous and best-liked dishes to present to you. To enjoy a typical Thai meal, each member ‘owns’ a bowl or rice, but all the main courses are for all to share. family members. The idea was to keep the children occupied, entertained and certainly let them practice their skills as a new recipe was created. So when cooking was done, naturally everyone would look forward to their ‘input’. 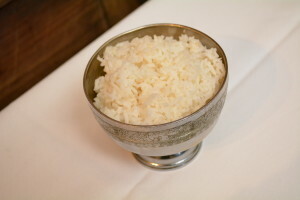 At the Old Thai House, so that you can share in this traditional experience, we offer you Jasmine Rice of your own. We encourage sharing because it gives you a chance to taste a new dish apart from your own. And of course, it’s much more fun! For those who are not so familiar with Thai food, we offer three well-balanced set menus which can be shared amongst the members of the table.